The family of a 23-year-old man who was shot to death Dec. 3 in East Los Angeles, on Monday ask for the public to help bring Gabriel Espitia’s murderer to justice. “My brother was left for dead in an alley on a cold December night and the suspect does not need to be walking as a free man with the rest of our society. This can happen to anybody, anybody who has children, brothers, cousins who are invited to a social gathering. We just need to bring him to justice and have closure for our family,” said Desire Kwan, Espitia’s sister. “He was not a gang member at all, don’t let looks fool you, or his family, he was a church member, attended Door of Hope Ministries, went to school and things. He is really loved and really missed,” she said. Gabriel Espitia was at a party with school friends when he got into an altercation with the suspect, according to his family. Sheriff’s Homicide Detective Adan Torres said Espitia was leaving the party on Saturday, Dec. 3, 2011 at around 10:30pm when he was confronted by the suspect. Torres also said witnesses described the suspect as a senior in high school, or having just graduated. “Before the shooting he was also seen with two other male Hispanics, who were very young of age, like maybe junior high or grade school,” he said. 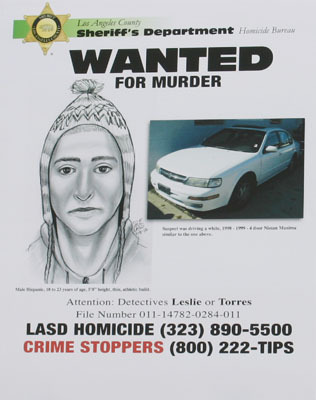 The suspect is described as a male Hispanic with light complexion, wearing a beanie with earflaps and strings, possibly between the ages of 18 and 23-years-old, about 5’8”, thin and athletic. He was seen driving a white 1998 or 1999 4-door white Nissan Maxima. 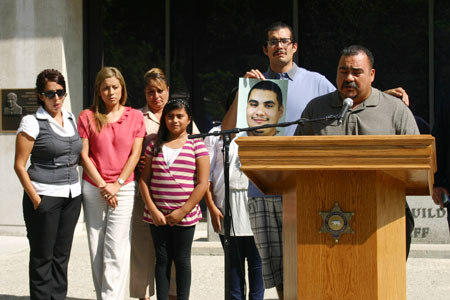 Gabriel’s father, Juan Manuel Espitia, said his son was a good person who worked two jobs. “What we want is the name of this person, if someone knows him [please come forward],” he said in Spanish. Anyone with any information regarding the shooting death is asked to call the Sheriff’s detectives at (323) 890-5500, or Crime Stoppers at (800) 222- TIPS.